Shortly before noon Monday, Baltimore Mayor Catherine Pugh seemingly responded to a letter from the Baltimore City Council that stated she should resign. BALTIMORE — Shortly before noon Monday, Baltimore Mayor Catherine Pugh seemingly responded to a letter from the Baltimore City Council that stated she should resign. Pugh’s office released a statement reiterating the position she has already held , that she will return to City Hall and resume her duties as mayor when she is well again. 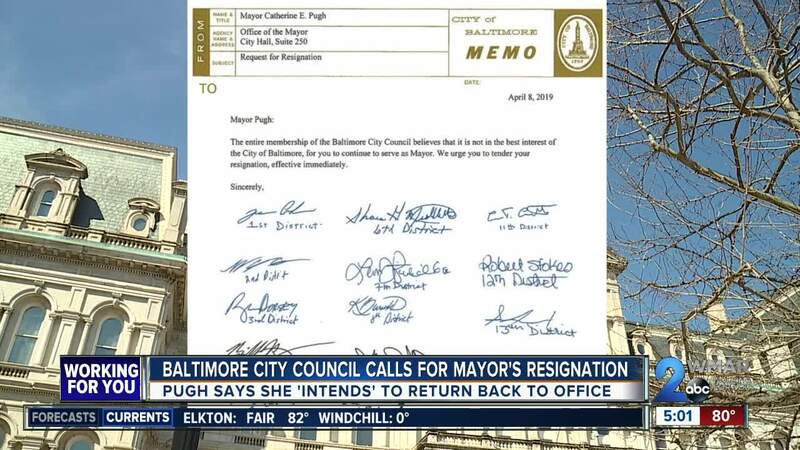 Pugh went on a leave of absence from her role as mayor at the beginning of April. City Council President Jack Young assumed the role in the interim, becoming Ex Officio Mayor, as per the city charter. P ugh is currently being investigating by the Office of the State Prosecutor as her dealing with the University of Maryland Medical System and several other organizations has come under scrutiny related to the sale of Pugh’s self-published “Healthy Holly” books. Pugh cannot be removed from office by the City Council as there is no impeachment contingency in the Baltimore City charter.